If MLB's wild card format has revealed anything, it's the scenario of what baseball would be like if teams only played one game a week. The term amplified comes to mind. Which usually leads to baseballs being hit hard, far, and often. Crazy things happen when baseball goes into one-&-done mode. That's what defined the opening innings in the New York Yankees vs Minnesota Twins clash to determine who meets the Cleveland Indians in a best-of-five division series. The Twins became the first team to go from a 100-loss season to making the playoffs. Well, one of the new dudes has become rather well known. It took the Yankees four relievers to take control of the game. David Robertson, in particular, silenced the Twins' bats and deserved being accorded the win. If being a catcher teaches dudes one thing, it's that a quality cup is essential equipment. 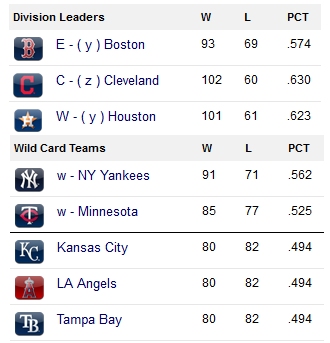 And if the American League playoffs are anything, it's a clash of the titans. The five teams who made the post-season were the only ones in the circuit who had winning records. Odds are the Yankees are gonna need that bullpen. Immediately afterward, manager Joe Girardi was unsure of his starter for ALDS Game 1. All he knows is either Sonny Gray or Masahiro Tanaka had better have five or six innings in them.